Part of the new library at South Portland High School. Students helped move in materials before winter vacation began. 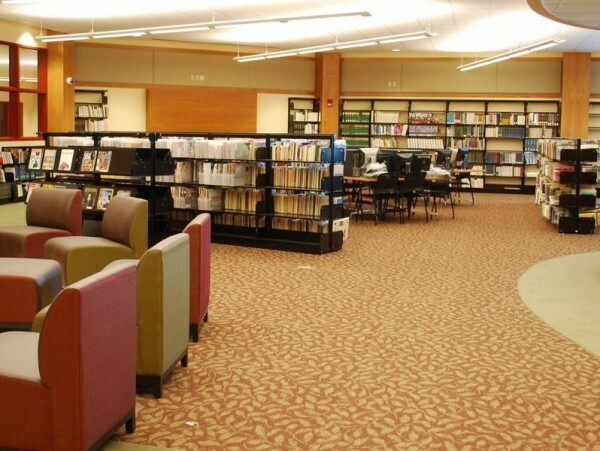 The library will be on view as part of a Jan. 5 open house. The new student entrance to South Portland High School is one of three entrances for staff, administrators and the public. 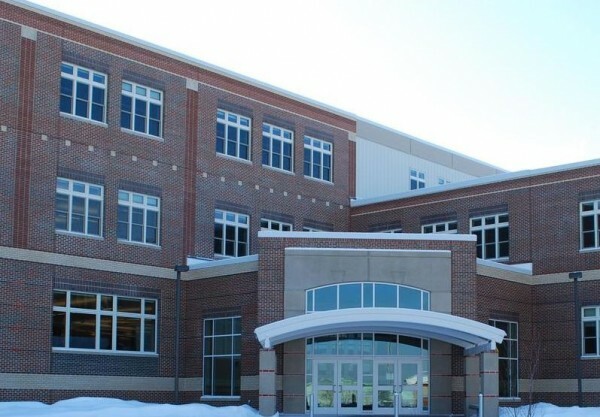 The addition opening Jan. 6 features new administrative offices and a cafeteria, and is part of a 100,00-square-foot expansion and renovation project due to be finished for the 2015 school year. SOUTH PORTLAND, Maine — Physics teacher Ralph Newell sees great possibilities when classes resume Jan. 6 at South Portland High School. “I’m going from the bottom to the top in one move. It only took me 47 years,” Newell said Monday, a week before classes shift from the aging “north annex” to a three-story addition that is the first phase of the $47.3 million school renovation and expansion project. The ribbon cutting and a public open house takes place 1-3 p.m. Sunday, Jan. 5. On Jan. 6 and 7, students using the addition will have amended schedules to help them get used to the new classrooms, lecture hall, cafeteria and library. In all, the expansion and renovation will add about 100,000 square feet to the school. The days are numbered for the annex, built in 1960. Its three floors of classes connected a wing of the original school, built in 1952, to Beal Gymnasium. Remediation work has started and demolition is scheduled for later this month. The annex will be partially reconstructed throughout this year. But its demise is not exactly lamented. “It was either really hot or really cold,” freshman Serena McKenzie said Friday. Her sister, junior Kyndra McKenzie, said real rooms with real walls will be an improvement. Last week, Russ Brigham, the School Department director of buildings and grounds, watched the last of six moving vans cart old furniture and annex detritus to storage, for eventual public sale, or donation to Ruth’s Reusable Resources. In the annex basement, chemistry teacher Hope MacVane and retired science teacher Glennis Chabot moved chemicals to improved, safer storage in the new building. MacVane and Chabot are high school safety committee members and annex veterans who knew the building section was outdated and outmoded. Improved ventilation, storage and wash systems will mean better safety as well, Chabot noted. MacVane said students pitched in to help her pack up the classroom. Scarborough resident Katy Foley said the Jobs for Maine’s Graduates students she works with helped cart library materials to the new addition and were eager to start classes. After decades in an annex basement classroom, Newell’s new room has a view of Mt. Washington and Martin Field. It is also better suited for lessons in optics; gone are the days of using darkened school restrooms. Demolition and reconstruction of the old annex will mean Mountain View Road will be closed until Dec. 31, 2014. The high school project is expected to be finished for the beginning of the 2015 school year. The second phase also includes renovations to the original school, the east annex extending to the auditorium and the auditorium, and former cafeteria spaces. City voters approved borrowing $41.5 million for the project in November 2010, but city Finance Director Greg L’Heureux said Monday he expects total borrowing to be about $2 million less than what voters authorized. L’Heureux estimated the cost of repaying bond principal and interest at about $54 million, about $6 million less than estimated during the bond campaign in 2010. He expects the final $9 million in bonds to be issued in March, with an expected $3.4 million in interest on the bonds. Newell said the new space should reinvigorate teachers and students.